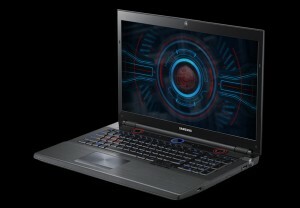 In October, Samsung will begin selling a powerful notebook series 7 Gamer, supporting work with the 3D-content. «Heart» gaming laptop – the quad-core Intel Core i7 second generation, the amount of RAM as standard is 8 GB (expandable to 16 GB). As part of the storage subsystem incorporates dual hard drives with a capacity of 1.5 TB total module and flash memory of 8 GB. The hybrid configuration allows you to increase the speed of loading the operating system and frequently used applications. The screen has a diagonal SuperBright Plus 17.3-inch (1920 × 1080 pixels), deals with a discrete graphics accelerator Radeon HD 6970M with 2 GB of memory. To view the stereoscopic images require special glasses. The laptop has an optical drive Blu-ray, 2-megapixel webcam, card reader, adapters, Bluetooth 3.0 and Wi-Fi, stereo speakers and a subwoofer. Its dimensions are 409,8 × 284,8 × 32,9-49,9 mm, weight – 3.8 kg. Samsung selects a special «gaming» mode: when it is activated the processor performance becomes maximum, the cooling system begins to function at full capacity, automatically shut off the touch pad and key Windows, to avoid interference during the game. In this case, the main game buttons have red backlighting, all the rest – blue. In addition to the «game» available «balanced» mode for everyday use, «library» for quiet operation, as well as «economical», designed to increase battery life. Buy a computer it will be possible for an estimated price of 1800 Dollars. I found theSamsung failure fix here.